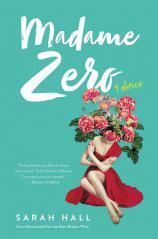 MADAME ZERO, a collection of nine short stories, is the latest from Man Booker Prize-nominated author Sarah Hall. The slenderness of the physical book belies its emotional heft and the vastly compelling world it contains. Hall masterfully controls the emotions of her characters in these stories, verging on surreal. The book is framed by two tales of transformation and filled with stories of realization and tribulation. “Mrs. Fox” opens MADAME ZERO. Sophia, a previously unremarkable wife, inexplicably turns into a vixen and raises a litter of kits in the forest near where she lived with her husband. A similarly unremarkable wife is the subject of the final story, “Evie.” Evie transforms into a fiercely sexual woman with a sweet tooth and a habit of poetic yet nonsensical phrases. Her husband, Alex, risks his relationship with her and their best friend, Richard, to satiate her desires, only to find that the root cause of her drastic change is medical. Perhaps the more successful stories, though, have more subtle character development. "Hall’s stories are dark and strange, sensual and finely worded, literary without being pretentious. MADAME ZERO is a quick read, but the images and characters will surely linger in the minds of readers long after the last page is turned." Becca, at the center of “Wilderness,” has come to her boyfriend’s native South Africa to find musical inspiration. Just a few days into the trip, she faces her greatest fear and takes a terrifying journey across Kaaimans, a dilapidated bridge over a viaduct. Following her boyfriend, Joe, and his childhood friend, Zach, from the home Zach shares with his enigmatic and religiously zealous wife, Becca approaches Kaaimans with a curiosity that turns to dread as the trio moves across the landscape and through a darkly inhabited tunnel. Hall beautifully describes the bridge and its body, and from Becca’s point of view it’s danger. “The iron girders were gory with rust; rust was bleeding profusely out of the bolted panels and leaking down the concrete legs into the river.” Becca’s anthropomorphic rendering of the bridge begins to make more sense as Hall reveals the source of her fright --- a barely remembered yet defining event in her childhood. Her panic about falling as she moves across the bridge and recalls an earlier tragedy is viscerally described and psychologically wrought. Eleven-year-old Jem in “Goodnight, Nobody” also faces what frightens and fascinates her when she brings her mother a left-behind meal at the mortuary where her mother works the night shift. She both hopes and hopes not to see her mother at work preparing the body of an infant who was killed by a dog close to her house. Hall wisely never lets the reader know the conclusion of her young protagonist’s quest. But we still learn a lot about the girl, and her keen and distant observations of her family and her world, as she confronts both the mundane and the horrifically extraordinary. Another trek takes place in “Later, His Ghost.” Here a young man has survived four years in a wind-destroyed post-apocalyptic landscape and now finds himself caring for a despondent and pregnant former teacher. As Christmas approaches, he risks life and limb to find her a copy of Shakespeare’s THE TEMPEST. Hall’s stories are dark and strange, sensual and finely worded, literary without being pretentious. MADAME ZERO is a quick read, but the images and characters will surely linger in the minds of readers long after the last page is turned.